Steve McQueen's iconic 1968 Ford Mustang GT. Of course, this is not just any old '68 Stang. This was one of the original cars used in the classic Steve McQueen film "Bullitt," a film that defined "cool" for a generation of Americans. Now, I get it. This wasn't discovering the Ark of the Covenant or the Ten Commandments, but the discovery stopped me dead in my tracks for two reasons. First, I own a 1968 Bullitt myself. Not the original, of course, but a very close replica. You can call it my "midlife crisis!" People either "get it" or they don't. On more than one occasion, when I have parked it in the lot, I will return with two or more admirers (always guys) standing by it with lots of questions. Secondly, this story was of special interest to me because I've just spent a year of my life working on a new biography and documentary of Steve McQueen (with Marshall Terrill). McQueen was Hollywood's "King of Cool" for a reason. His legacy lives on in a new generation as his image is ubiquitous in culture (especially hipster culture). He also still appears in modern films like the recent remake of "The Magnificent Seven." Yet, for most boomers like me, we can't forget when we saw the original version of "The Great Escape" as McQueen played Virgil Hilts in a role that propelled him to super-stardom. Then there's his role as the detective Frank Bullitt. He literally flies his car through the streets of San Francisco in what is regarded by many as the greatest car chase scene in cinematic history. Steve McQueen was not cool because he drove the Bullitt car. The Bullitt car was cool because Steve McQueen drove it. At the time, Steve McQueen was the number-one movie star in the world, and he is still used as a point of reference for masculinity and "coolness" to this day. He was (and is) the definition of an American icon. Only in America — with America's dream — could McQueen transform his hardscrabble beginnings into epic stardom. Yet, until late in his life he struggled to find meaning in life, and he suffered because of it. It might have been because he was born into a home of an alcoholic mother and a father that left him early in life, but eventually he found himself on the wrong side of the law more than once. Then, as his star began to rise higher and higher he began to chaser harder and harder after every pleasure this planet had to offer. But notwithstanding all his fame and fortune, a colossal vacuum lived rent-free in Steve McQueen's heart, a yawning chasm, a lack of purpose rooted in the absence of functional, involved parents. He spent his whole life avoiding his mother and searching for his father — searching for someone or something to stand in for him, someone to love him. While still the top movie star on the planet, and with all the money and power in the world, he decided to search for more than this world could offer. That was the story I was interested in, and I chased it till I found it. Everyone knew about McQueen's Bullitt! But I wanted to find McQueen's salvation. McQueen knew he needed God, and he found his way to salvation through Billy Graham's gospel message. In fact, Billy visited him and gave him his personal New Testament from which he shared with him the teachings of Jesus. Tragically, Steve McQueen found out he had cancer about six months after his conversion. As Steve's son, Chad, said in a recent interview, "I think Dad was finding his way to go to the next place. I remember, he would wake me up at seven in the morning to go to church, which never happened before he got ill. So I think he was looking for peace." When McQueen died on an operating table in Mexico trying one last time to beat back his cancer. He died clutching the Billy Graham's bible. He nearly missed it but eventually he found what so many others need today, especially at the heights of fame and fortune. He needed faith in God, again. 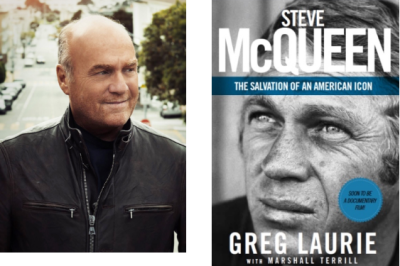 Click here for information on the one-night "Steve McQueen: American Icon" movie event on Sept. 28.